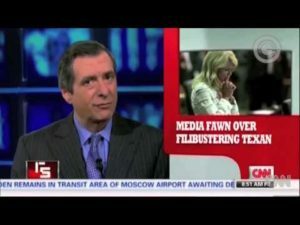 On his final appearance on CNN’s Reliable Sources, host Howard Kurtz exposed the mainstream media’s bias in favor of pro-choice politicians, during a brief commentary on Democratic Texas state senator Wendy Davis. She is the person who staged an 11-hour filibuster last week that successfully prevented the Texas Senate from passing a tough anti-abortion law. Kurtz noted that after her performance, the media rushed to embrace Davis and made the backbench senator a media star. While Kurtz thought Davis’ performance was an impressive physical feat, he questioned whether the media would have done the same had she been a pro-lifer arguing against a pro-abortion bill. But I have to ask, if Wendy Davis had been conducting a lonely filibuster against abortion rights, would the media have celebrated her in quite the same way? The answer, as Kurtz knows, is an emphatic no. Davis is only a media darling because of her pro-abortion views. Had she been a conservative, pro-lifer, she would have been either ridiculed or ignored.